Figures, I was reading news stories after posting to the blog. There’s a story about our hotter than usual summer. What I really wish I could do is live in Vermont half of every year and visit AZ and FL during the winters…while going to visit Portland, Oregon in between all the seasons. I need to think of something clever to make money so I can do that 🙂 I was just reading about the pet rock craze. You never know……. Food Not Bombs, what to do? Last night was extremely uncomfortable. Between the belly swelling, pain and fever I was restless. This morning I went to the park for free food. I was supposed to go with my friend Sharon, but ended up meeting Gordon on the way. He had been cleaning his LDS meeting house since early morning. Today there were lots of people and only a few boxes of food. That’s OK…. now I understand the importance of going each time and getting a little here and a little there. I quickly knew it was a mistake to be out and about. I was so dizzy that I kept running into things. I only screamed a few times when I hit bumps with the wheelchair. Mostly I just moaned and groaned. By the time I got home, my fever had zoomed up. It was about 80° out…practically freezing for SLC! I was totally soaked in sweat, my hair was dripping and I had to keep wiping my face. Took my clothes off and sat in front of the fan with the A/C cranked up. I honestly don’t know what to do. I feel yucky, but not bad enough for the ER. I hope to rest and relax and see if I can keep my fever down. I sure do have a monster headache! Didn’t get a call or text back from my nurse, so I called the surgeon’s office. She asked a few questions and then found a student doctor who decided the swelling I was having must be from an ingrown hair. WHAT??????? Are we inhabiting the same planet? My Motrin hadn’t even worn off yet and I had a fever. 99.9°. This is the same student doctor who thought nothing was wrong with me when my belly was infected. She scares me 😦 Good thing you can’t hear the words in my head right now! They want me to come in Tuesday if I still have a problem. I have written and rewritten this post several times. Even though I saved it after every sentence or two, it disappeared when the phone kept turning off and on. I can’t believe I was able to make a phone call. It didn’t work yesterday and won’t work now. Sigh….. I do not understand where the substance comes from! You don’t gain 20 pounds from food in a couple of days. I also don’t drink enough water. Do I just grab it out of the air??? The swelling and bloating now goes from just under my breasts to the top of my legs. This sure has been a bizarre string of ailments one after another! Is there some lesson here I am missing? What do I need to learn? Sigh….. This morning I started having pains in my upper belly that were hard to pinpoint. They were worst when I was bending forward or if something brushed against my belly. It’s a sickening, diffuse….but at the same time, sharp, pain. Weird. Lower down, I am still numb after the operations, but oh, my gosh…that part of me has never swelled up with edema before! During the emergency operation, infected parts of me were cut away…then the fascia was stretched from all directions in order to sew me back up. Where there used to be valleys for bending at the juncture of legs and hips was now taut. That was wicked painful for weeks. Now, since the latest swelling, there is almost no dent where my legs move. Sometimes it aches/hurts/stings for hours. As usual, I have no idea who to see for help and advice. Frustrating! OK….the nurse was just here. He is going to call my surgeon right now. He thinks I might have to go to the ER. :-( Of course I do….I get the worst for nights, weekends and holidays….and this is a big deal weekend. Sigh…. I need to go get ready to go to the hospital….. I went to the park for free food. Not a lot of quantity…but excellent stuff!!! I got to be the person to call heads or tails and then I got to be first in line. That’s how I ended up with the cheesecake 🙂 This was my third visit to the Food Not Bombs food distribution. I can see that the best strategy is to go 3 times per week and only take a few things from the tables. There was a box of rotten looking cabbage. Most people didn’t know all they had to do is peel off the outer leaves. I got 3 yummy looking muffins in a bakery bag and put them in sandwich bags to freeze. The new grocery ads came out, so I went a few blocks farther after going to the park. I bought chicken, pork and burgers on sale and repackaged them for my freezer. 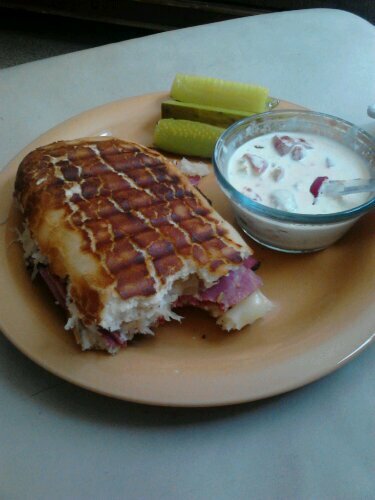 For several months now, I have wanted to make a Reuben with my grilling machine. Each time I looked at the price of pastrami and corned beef, I changed my mind. My phone is a PITA!!!!!! It won’t let me listen to messages or talk. It won’t charge. I am writing this with the cord on…which makes it turn off and on like crazy….well, EVERYTHING makes it do that! My lower abdomen is still swelling up at an alarming rate. That’s a new one for me. 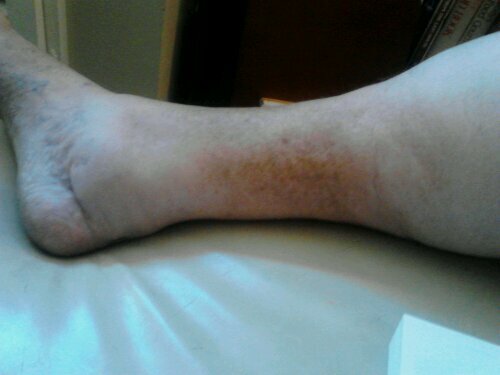 I am waiting to see what the nurse says about it tomorrow. When I got up for meds, the phone was plugged in for charging. I was surprised to see it lit up. The time said 5:54. I unplugged it, but the charging light was still on. I took the battery out and rebooted. When the time popped up, it said an hour later. Within a few minutes, all the charge was drained out. I turned off the phone and plugged it in to recharge. I was reading when movement caught my eye. I looked over to see the phone turning on by itself. Now it was 7:54. What the heck? Is that why it won’t charge sometimes? It just keeps turning off and on every hour? Earlier when the charge got down to just a few percent and I tried to turn it off for charging, it rapidly cycled off and on a bunch of times until I took the battery out. This phone has done the darnedest things in the last couple of months! Has stuff like this ever happened to anyone else? It’s virtually useless to take anywhere. I have to leave it home, plugged in. I tried bringing it with me, but turned off. The darn thing turns on again by itself even when unplugged. I am getting a complex. The wound vac, the oxygen concentrator, the phone….they get near me and go nuts! Now it’s 4PM. I have been trying to charge the phone ever since I first wrote this morning. An infection has come back to my belly wound. The nurse seems worried. It was pretty darn gross when he took off the bandage. Phew! I have been worried about my lower abdomen and pubic area. The nurse asked me why it was swollen so much and then I knew it wasn’t my imagination. Sigh…. He was brutal 😦 The nurse poked his finger all around my spongy, mostly numb flesh. I could only feel the pressure. Half an hour after he left, I was howling in pain. It’s even more swollen up now. I had been happy today as my neck pain mostly vanished overnight. The nurse thinks it got better because I got a new oxygen concentrator. I told him about my constant peeing, too. Each time I am low on oxygen, I swell up from head to toe…then pee it out when my oxygen is increased. This new abdominal/pubic swelling is weird. It had better be benignly weird and not must go to the doctor weird. Also, all day the leading edge of the lipodermatosclerosis on my right leg has been having sickeningly sharp pains followed by a deep ache. The fat is quickly disappearing at the top of the line on the back of my leg. My ankle is pretty puffy, too. Yesterday I was reading about Job and disabled people. We are counseled not to get discouraged to the point where we “curse God and die” as Job was told he should do to just get it over with. That made me laugh in a sad sort of way. During the darkest hours that seems tempting. Hopefully I am strong with God’s help! At noon I was sure it was 5 PM. From all the pain and medical equipment mishaps, my sleep/wake cycle is totally messed up. I really needed some OTC medicine. I wasn’t thinking very clearly when I set off for the Smith’s store over a mile away. I could have gone to Family Dollar on the next block. Sigh…. I toodled around the store slowly, enjoying the air conditioning and looking at everything. I spent $10.58 in FS and $4.68 for the two meds. When I got back outside, it sure looked like a storm coming. I felt every single crack and bump in the sidewalk ten fold. Ouch. My guts are not happy and my brain is on vacation without me. I slept for 2 1/2 hours. I had clothes on, was totally under two blankets, and never stopped shivering the whole time. I need a repair of my human thermostat! Geeze…I can’t stop yawning. I still feel creepy/lupus-y all over. Not sure if I should force myself to stay awake awhile or if I should go crawl back in bed. Stuff wrong with me is not conducive to sleep. Sunday morning there was a leak that made the wound vac alarm go off. It was an easy fix. Tonight I could NOT make it better. I messed around with plastic for the wound, poking my belly, stuffing a pillow in my belly, sleeping on my stomach (ow my neck!) and finally I just got up and called the night nurse. She will be here soon. I will be very, very happy when this thing is off me because I am healed!!! I should have called sooner. I knew it was going to be unfixable right away. All the poking, prodding and flipping and flopping made me sore and gave me a monster headache. I keep trying to find remedies. The oxygen concentrator was a hopeless case…and so is this wound leak. Sigh…I get to the can’t stay awake another second phase and then go nuts when I can’t sleep. This week medical equipment is as bad as aches and pains…it all hurts and is a hassle. Sigh….. I forgot how nice this nurse is. After she made the leak stop, she gave me a light neck massage 🙂 I only screamed a few times. I hope I can get in bed…and stay in bed. So sleepy! My nurse cleaned out some yuckiness from my belly. He says we need to work on places where my skin is breaking down. He thinks the wound juice trapped against my skin is growing a yeast infection. That could be why I had a fever. 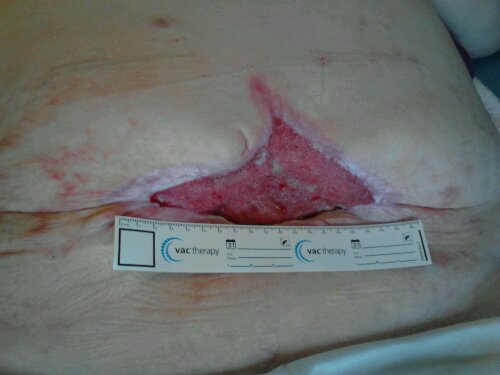 The belly wound continues to shrink in tiny increments. It sure looks better when I lie down rather than stand! I was outside waiting for my nurse and people would come over to talk to me. It doesn’t take much talking to bring on multiple throat and neck spasms. I burst into tears twice and felt like such an idiot. People could see I was in tons of pain. I am going nuts from spending so much time alone…but at least I am the only witness to my tears. I want to talk and hang out, but that exacerbates the pain. Sigh…. I have a fever of 100.6. I feel flu-like all over. Lupus stuff? An infection? Both? A disease from outer space? When I woke up at 9 PM, I was frozen to the core. Now, 2 hours later, sweat is pouring off me even though it’s cool in here and I am sitting in front of the fan. When I woke up, I could barely swallow. I am doing better, but it still hurts. I was in the bathroom washing my hands when I couldn’t take a breath in. Ohhhhh, my gosh! My face was worth a bazillion words. It was a combo of terror and pain. If I saw another human being with that face, I would seriously freak….and call 911. I am tired of being sick!!! Did I accidentally pray for patience again? Dang.